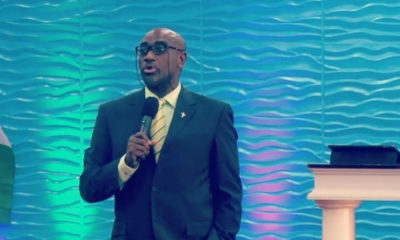 Reverend Yomi Kasali, senior pastor of Foundation of Truth Assembly, in an impassioned sermon, said the cathedrals Nigerian churches are building is with corruption loot, not tithes and offering. I said it before and i will keep saying it, The 2 main religions are the bane of Nigeria, They contribute immensely to the bad state of things in Nigeria. it is about time we call a spade a spade. They collude with looters to hide and stash away our resources. it is indeed very sad. Tee it’s not the religion but the way it is being implemented by people who need to fix themselves…..
Afterall religion says thou shall not steal….. If Nigerians hate corruption the way they hate one another’s religion. We would have been a developed country a long time ago. Anybody that wants to cheat will wear religious cloak and begin to preach hate and instigate divide. I’m one of the people you can’t infect with that venom because all I want to see is your works and impact. Show me a man of God who doesn’t love money!!!!! I truly applaud this pastor for speaking the truth!!! Corruption is indeed our biggest religion. For years I would sit down in church and wonder why pastors would refuse to teach on corruption when it is clearly one of our biggest problems. But I guess if the churches have forgotten their biblical purpose and are trying to build big empires that they can govern and pass on to their children then the rules change. There are few things that Jesus emphasized on in the Bible more than the love of money and how you cannot worship God and money. You must pick one. Our pastors and men of God must pick one! If all the churches Put the overflogged messages of tithing and giving and blessings aside went on an anti-corruption campaign for just one week, we might begin to see some changes in our country. I love this man for addressing this oh so massive elephant in the room! I hope the other “big men of God” are listening and taking notes. This is really an eye opening truth that the church as a whole has been shying away from. Kudos to you Reverend! No wonder Jesus categorically stated in the bible that judgment is going to start from his house; the church. These so called men of God steal from the poor to help who? They build schools, and institutions that the very poor they rob can’t afford. If they truly followed Christ, they would also follow his ways. Christ lived and walked among the poor. He took fish, and bread and fed five thousand, he didn’t take from five thousand to buy private jets. The saddest part is not the pastors exploiting these unfortunate souls, its the unfortunate souls who give everything that have, and get nothing in return.